In junior high, my class went on a ski trip to Bolton Valley. Dana C. and I were in the commissary at the Black Bear Inn, and she ordered a cinnamon bun the size of her face. When she finished, she stood up and shook her hands in victory, as an imaginary crowd cheered on. It was with such joy and sense of accomplishment, that I ate the most magical sandwich. Just as we come together with friends and family on Thanksgiving, so too do the fruits of many days labor, join in celebration– between two slices of seven grain bread. 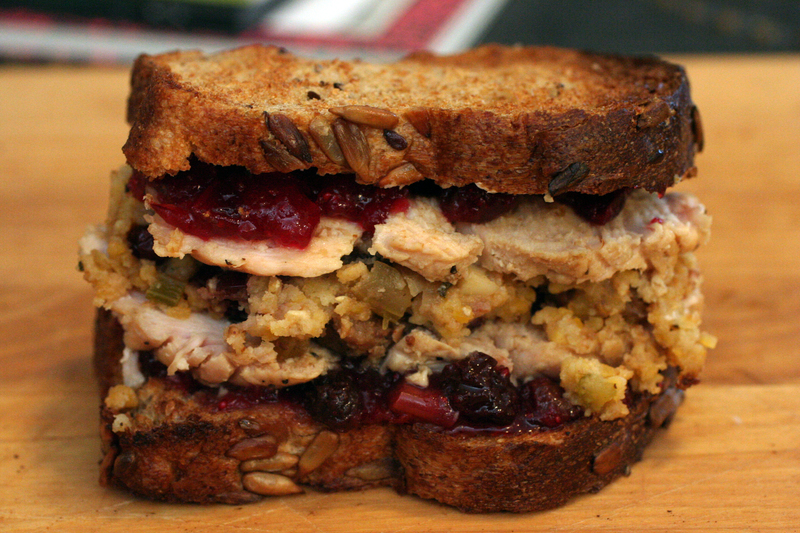 To elucidate the layers: a delicate schmear of brie- adding just a touch of creaminess, a spoon of sweet/tart cranberry sauce, a slice of fresh roasted turkey breast, a heap of cornbread sausage stuffing— and back again- turkey, stuffing, cranberry, brie, toast- piled high. Call me crazy, but as Corcoran said I am probably the only person in America to buy and roast a turkey breast, the day after thanksgiving. But as it was- I had all the fixings, but none of the meat in my leftovers, so I did what had to be done. Melted butter for about 20 seconds in microwave to just soften. Mix in herbs. Take turkey, rinse and set in roasting pan. A little trick I once learned, if you don’t have a roasting rack, you can take a big piece of tinfoil and roll it into a big S shape, creating a platform for your meat to sit on, allowing space for the drippings to fall down. Slathered the turkey in the herb butter, then sprinkled very generously with kosher salt & pepper. Baked for an hour and half, basting with chicken stock about every thirty minutes. I cooked until juices ran clear and internal temperature reached 150. According to FDA regulations or some such, they say to cook until 165, but in that class I learned about the S foil rack, I learned that anything over 145 for chicken is fine– and that if you actually go to 165 your bird will completely dry out. So do what you feel comfortable with, but I go 150. I decided to go cornbread stuffing this year and used a recipe by Anne Burrell. Preheat to 350. Coat a large saute pan w. olive oil. Add onion and celery and saute over medium heat. Season w. salt and cook until vegetables are soft and very aromatic. Add sausage and cook until sausage begin to brown. Stir in the garlic and saute for another 1 to 2 minutes. Add the walnuts, sage and rosemary and cook for another minute and then remove from heat. In large bowl, mix together cornbread, cranberries, and sausage mixture. Add some stock and knead w. your hands until the bread is very moist, actually wet. Taste for seasoning and season w. salt, if needed and transfer to ovenproof dish. Bake stuffing until hot all the way through and is crusty on top, about 30 to 35 minutes. As a base for the stuffing, I wanted to make my own cornbread- and used a recipe from Silver Palate. To ensure 10 cups, I made two batches of the recipe below. Preheat to 400, grease a 9×9 inch pan. Stir dry ingredients together in a large bowl. Then stir in buttermilk, bacon, butter ad egg, mix gently. Pour into pan, set in middle rack. Bake for 25 minutes. Cornbread is done when edges are lightly browned and knife inserted in center comes out clean. Cooled for a few minutes, then flipped onto cooling rack to finish cooling. If want to make muffins: spoon into 10 greased muffins and bake for 20 minutes. In order to get stale for stuffing, I cut into 1 inch cubes, and left spread out on baking sheet for 2 nights. Then toasted for a few minutes in oven to further dry out. The Brie: From the co-op. $1.76 for a wedge, I’m just saying. These did not make it to the sandwich as there were no leftovers. After much deliberation, I decided to go the classic marshmallow topped route, with a recipe from Barbara Haynes. You can do totally prep this all the night before, then just heat the day off in oven- add marshmallows and toast. Preheat oven 375. Prick the potatoes with a fork. Place directly on rack in over- no baking sheet. Cooking 1 hour (few minutes more or less depending on size of potatoes) until they are soft. Wait a few minutes until cool enough to handle. Skins peel off quite easily. Mash with fork (or potato masher if you have, I don’t.) While hot, mix in all other ingredients. Put in baking dish. If re-heating cook for about 30 minutes to heat through. If potatoes already hot might take less time. 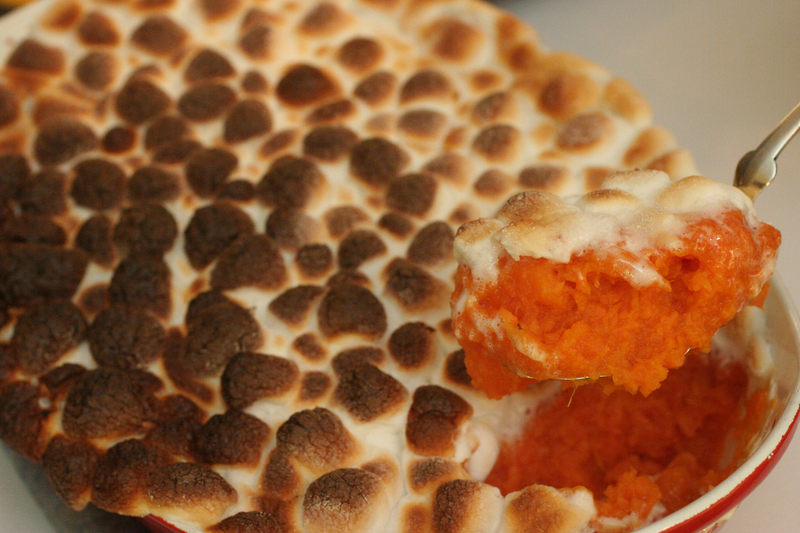 Add a layer of marshmallows, and turn oven to broil for a minute- until toasted. Watch closely they will burn! Japanese two posts in a row! Donburi is a rice bowl dish, and while ground chicken is not something I ever make- this Harumi recipe intrigued me. It is seriously tasty– and very quick and easy to make. 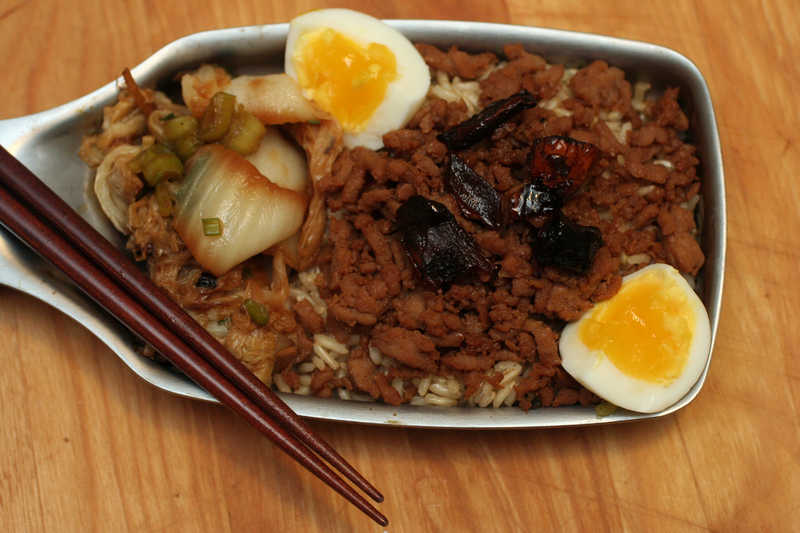 It is topped with sweetened shiitake mushrooms and a (just a little bit) runny egg. I decided to braise some napa cabbage on the side, as Jess gave me her CSA stash, and I had to put it to good use. Soak mushrooms in warm water until soft, then lightly squeeze out, removing excess water, reserve excess water. If any mushrooms are big, slice. Put all ingredients in small skillet, including the 1/4 mushroom water. Bring up to a lively simmer. Cook until most of the liquid is evaporated [this took about 5 minutes.] They get sort of caramalized. Make egg, by boiling for 8 minutes in boiling water. Place in cold water to cool. Peel and quarter. The key to this- is to cook the cabbage in a searing hot skillet- high heat is essential – to caramelize the leaves. Saute in two batches so overcrowding doesn’t steam the vegetables. In a large skillet or wok, heat 1 teaspoon of the vegetable oil . When it is very hot, add half the cabbage. Cook, stirring constantly, for 3 minutes or until leaves begin to brown. Remove them from pan. Use 1 teaspoon of the remaining vegetable oil to cook the remaining cabbage in the same way; remove from the pan. Add the remaining 1 teaspoon vegetable oil to pan. Cook the garlic and ginger, stirring constantly, for 1 minute. In a small bowl, stir together the water and cornstarch. Stir the soy sauce into the pan. Add the cornstarch mixture and bring to a boil. Return all the cabbage to pan, stirring well to coat it all over. Cook, stirring often, for 5 minutes or until the cabbage is tender. Remove from the heat. Stir in the scallions and vinegar.